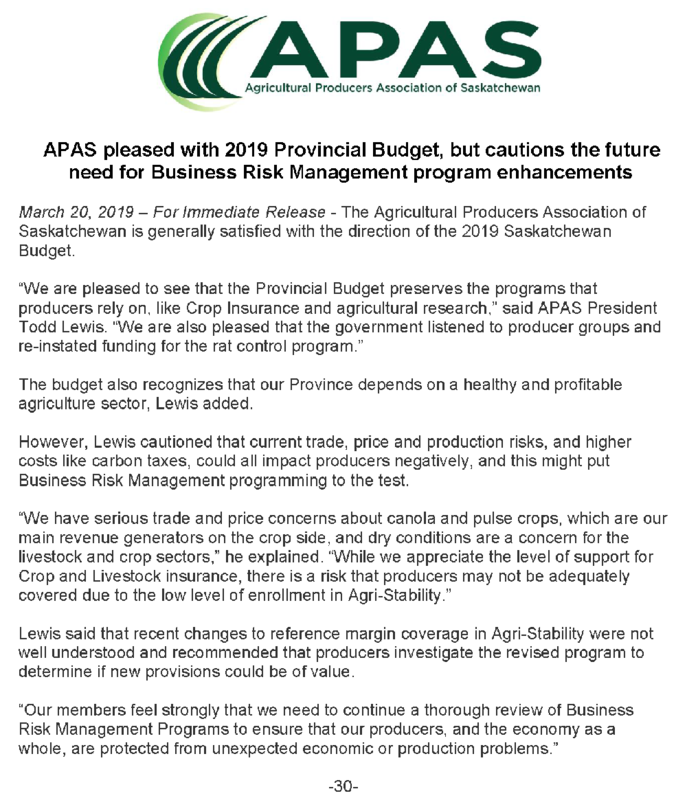 March 20, 2019 – For Immediate Release - The Agricultural Producers Association of Saskatchewan is generally satisfied with the direction of the 2019 Saskatchewan Budget. The budget also recognizes that our Province depends on a healthy and profitable agriculture sector, Lewis added. However, Lewis cautioned that current trade, price and production risks, and higher costs like carbon taxes, could all impact producers negatively, and this might put Business Risk Management programming to the test. Lewis said that recent changes to reference margin coverage in Agri-Stability were not well understood and recommended that producers investigate the revised program to determine if new provisions could be of value.